With more than 50% of Infrastructure leaders anticipating moderate to high risks for the technologies they’re deploying this year, the potential of failing to meet business demands is larger than ever. 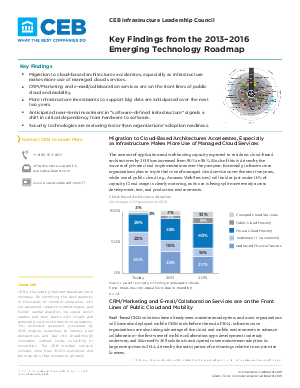 To help you overcome this uncertainty, we have benchmarked the adoption timelines, enterprise value, and deployment risk for 73 emerging technologies – based entirely on data from more than 400 IT professionals at leading companies, and not influenced by vendors. Improve confidence in your technology plans and break through the vendor hype with a real-world look at technologies actually being deployed by Infrastructure functions across the globe.